Caterham have had a shake-up of their Formula 1 team's management in their attempt to move up the grid. Team owner Tony Fernandes has created a new role of chief executive officer. Frenchman Cyril Abiteboul, Renault's deputy F1 boss, will start in January. He will report to Fernandes and group CEO Riad Asmat, who has been de facto team boss since their debut in 2010. "We have been looking for the right person to lead the F1 team for a considerable period," Asmat said. "Cyril fits the criteria we set out… He is a key part of our long-term development and will help us build the foundations we have created since we first entered the sport in September 2009." Caterham started in F1 in the 2010 season as Lotus Racing. They have consistently been the best of the three new teams who started at that point, but have so far failed to bridge the gap to the back of the midfield runners. Fernandes spends a relatively small amount of time on the F1 team as he concentrates on his other business, such as the airline Air Asia and Premier League football club Queens Park Rangers. He is understood to feel that with Asmat concentrating on the success of the Caterham Group, which includes road cars and a technology business, the F1 team needed a hands-on boss to ensure it makes the progress he requires. 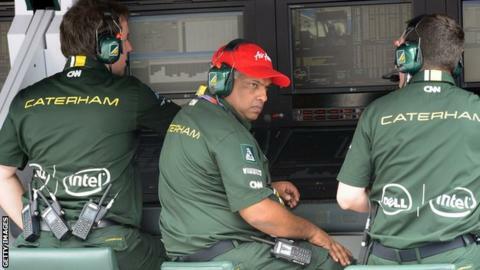 Fernandes said: "Cyril's appointment is more good news for our Formula 1 team. As CEO he will lead our F1 operation and will work closely with Riad, who can now turn his full attention to the continuing growth of the wider Caterham Group which is already active in the automotive, aerospace and marine industries."